For more than a century Young's Night Thoughts was one of the most influential, widely praised, and well-known poems in the English language. Most importantly, it was a seminal influence on the ‘secular cult of sepulchral melancholy’. 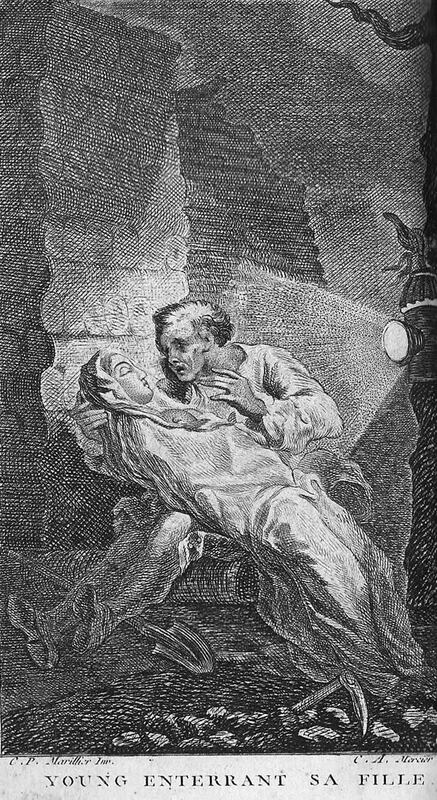 Young brought it out in nine parts between 1742 and 1746: the third part dealt with the famous ‘Narcissa Episode’ in which a young Englishwoman, dying in France, was buried by night in a previously used grave, deprived of the dignity the French gave even to their dogs, because she was a ‘heretic’. Enlightened Frenchmen responded to the charges of obscene bigotry by not only erecting monuments to so-called ‘heretics’ (i.e. non-Roman Catholics) in their gardens, but, even more potently, burying the bodies of men like the Protestant-born Jean-Jacques Rousseau (1712-78) and Antoine Court de Gébelin (1725-84) in their gardens and erecting monuments over their graves in order to demostrate publicly their lack of bigotry and their open-minded credentials. These factors played no small part in the origins of the new garden-cemeteries without which no nineteenth-century town or city could function (despite clerical opposition). This lecture demonstrates the fascinating history of the transformation of the horrific urban burial-ground into the beautiful landscaped cemetery prompted by the outrage occasioned by the European-wide dissemination of the Narcissa story from Edward Young’s (1683-1765) The Complaint: or, Night Thoughts on Life, Death, & Immortality.